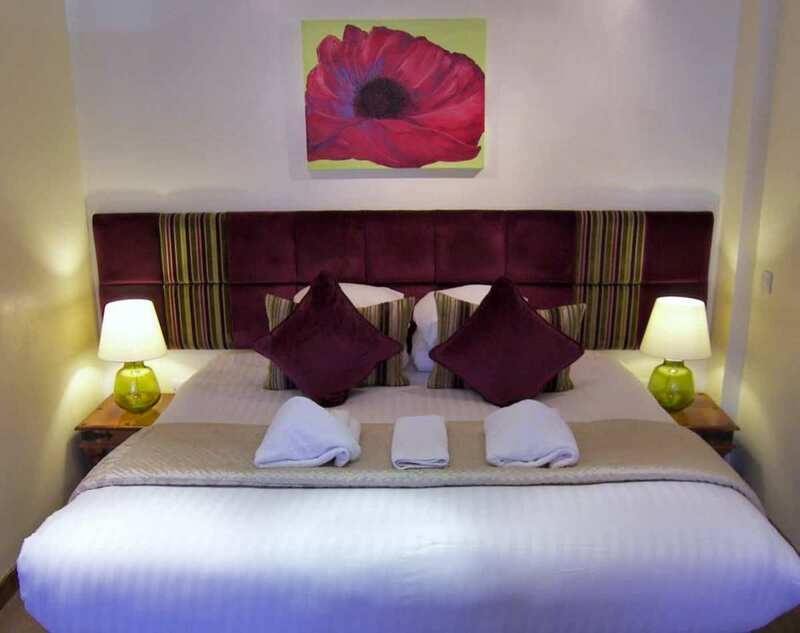 If you are currently researching Dog friendly holidays Pitlochry and trying to find a great place for holidays in Scotland with pets, then you may need look no further than Rosemount Hotel in Pitlochry. 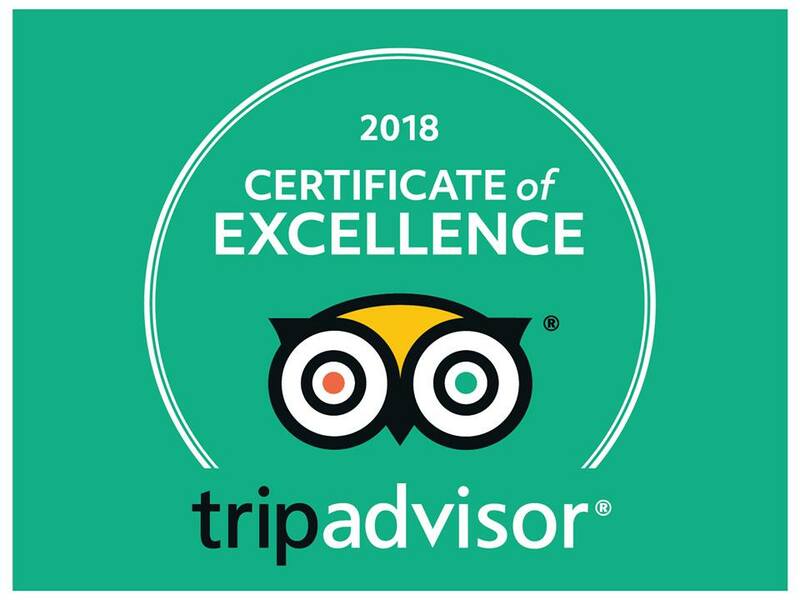 Guests have kindly mentioned in reviews that we set a bit of a standard for dog friendly holidays in Scotland. This might just be because our dog visitors are treated as the important family members that they are. We understand the fundamental requirement that managers and staff of hotels that take dogs should be dog lovers. The importance of this cannot be understated. Additionally, we train staff in certain aspects of welcoming pets to our door. These fabulous, sensitive creatures require as personal a service as their humans do. When you take a holiday with dogs in Pitlochry, you’ll probably want your dog by your side constantly. We have dedicated areas where pets may accompany owners at mealtimes and enjoy the companionship of our other guests as they relax. There are many miles of dog friendly walks leading from our door and a park just across the road for the necessities. 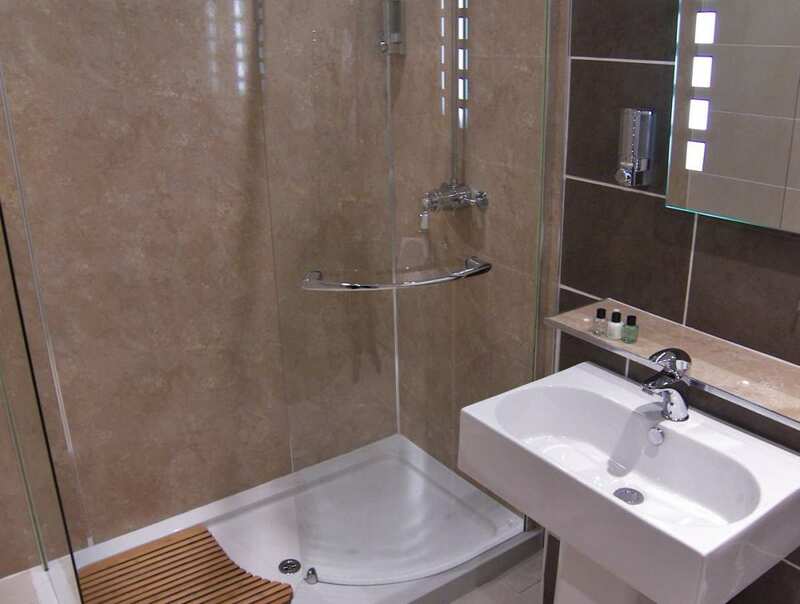 Hosing and drying facilities are available to deal with the aftermath of the best of walks. 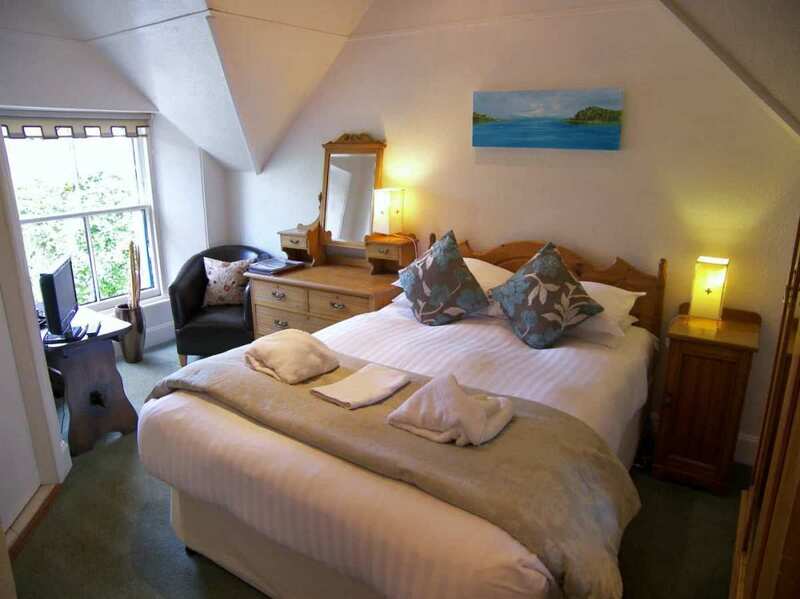 Our Pitlochry Hotel deals are highly competitive and change regularly. 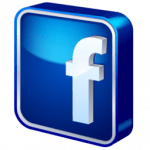 These frequent changes are made to ensure that the best value is offered at all times of year. Please check rates often. 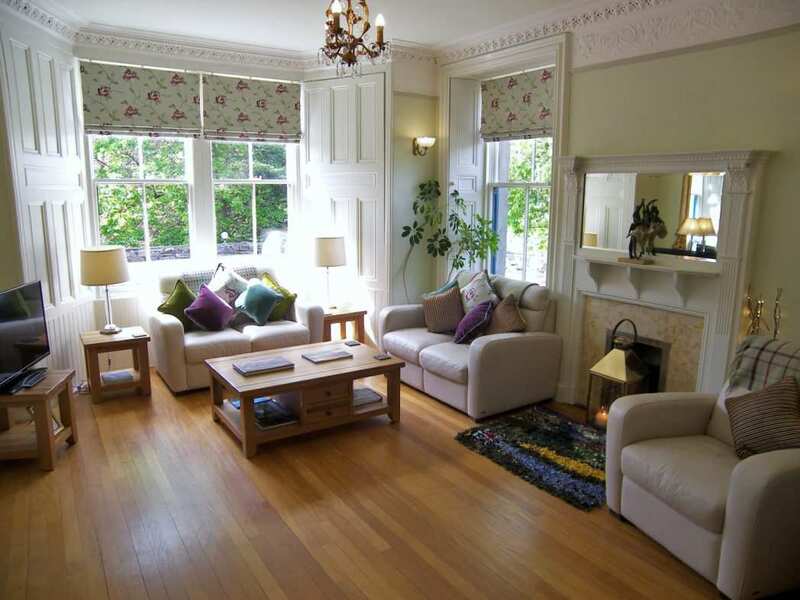 If you are looking for dog friendly B&B in Pitlochry, then you’ll find some great deals here. Don’t forget that you are invited to eat in the company of your dog in designated areas of the hotel. 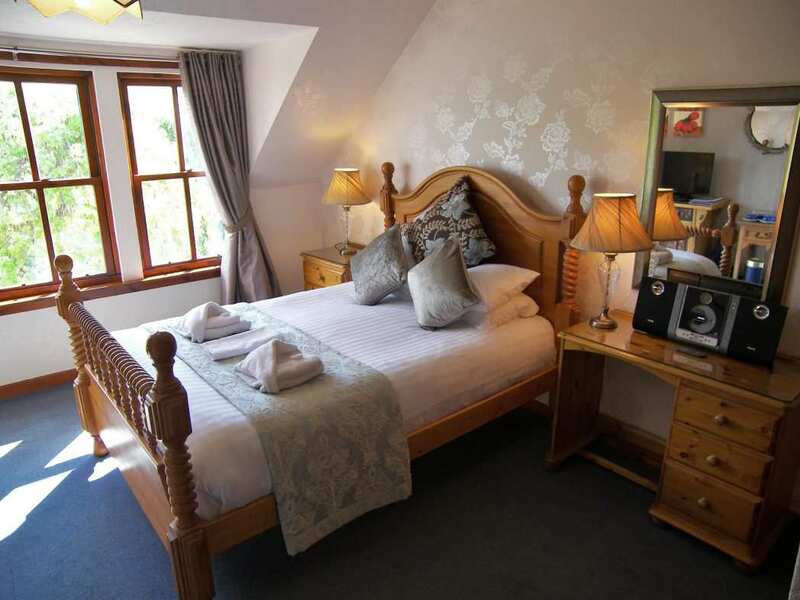 This pet friendly hotel in Pitlochry is located just 5 minutes from the main street in a peaceful part of Pitlochry which is convenient for all that the town has to offer. We enjoy gorgeous views over the Tummel Valley and then upwards towards Ben Vrackie. As reviews will testify, we are dog-lovers and naturally warm to having canine companions as our guests. Of all the dog friendly hotels in Pitlochry, we hope that defines us as an important part of the sector. Dogs are a very important part of our “day-to-day”. We want to know your pooch’s name, their favourite treats and whether they’ll eat a sausage for breakfast. It matters to us that you find the best walks for them and a brilliant free map is given on arrival pointing out miles and miles of fabulous Pitlochry walks. More than half of our rooms and dining areas are offered for the holiday enjoyment of our pet-owning guests and their little darlings. 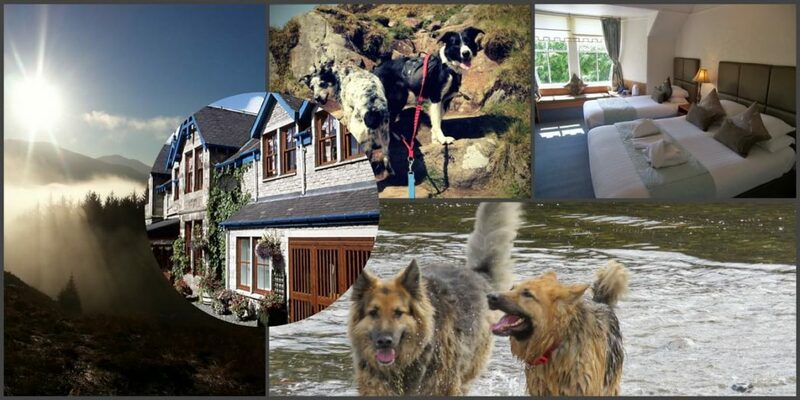 At Rosemount dog friendly hotel in Perthshire, we treat our canine visitors as guests. It is important to know their names, likes and dislikes and put a great deal of energy into allowing pets and you, as owners, to have a totally relaxed experience in an atmosphere of welcome. Subject to one or two courtesies, pets are welcome in half of the Hotel, including all levels of bedroom (50% of each category) and the bar. Rosemount provides designated, separate areas for dog-owning guests to enjoy their meals with dog at feet. This sets us a bit apart from many pet friendly hotels that actually do not permit dining with the dog. Reception is stocked with doggy treats and whilst we ask that dogs are not left unattended on the premises unless happily in a crate, we will gladly allow Fido to help us out at Reception, if they are glad to do so, whilst you take in a distillery visit or pop to the shops for an hour. This is an impromptu gesture, offered in friendship, not as a charged-for part of our service, and we need to take care it doesn’t take on a formal guise. 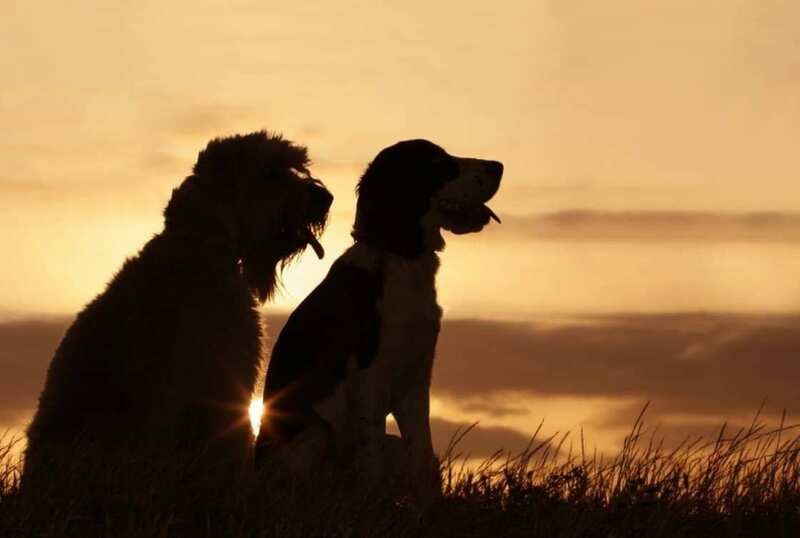 We are not registered dog-handlers, but are pleased to offer a friendly helping hand in line with our status as a pet friendly hotel in Scotland. There are a few dog-minders in the town for more prolonged periods of dog-sitting. Just across the road from the Hotel is a park with several red doggy-bins – a great way of ensuring that undesirable sources of scent don’t build up around the hotel. Our extra-intensive cleaning regime means you would never know we take dogs on the premises – a well-voiced accolade we would rather like to hold on to. So – it’s a big “thank-you” to all of our canine-inclusive families for respecting those little niceties that make all of this possible. 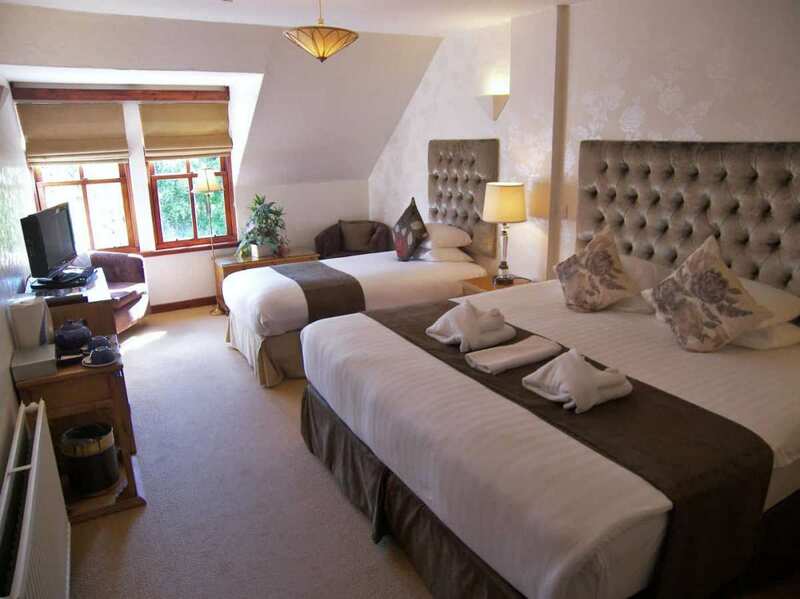 Lets make all holidays at Rosemount Pitlochry memorable for all the right reasons. So, after the early morning visit to the park and a delicious, hearty breakfast with your best pal at your feet, what next? There are 40 miles of way-marked walks and trails radiating from Rosemount’s doorstep. We sell an excellent publication called Pitlochry Walks for £1, which synchronises with the colour-coded, waymarked posts dotted along these walks so you can meander through miles and miles of forestry, along rivers, past waterfalls, up hill and through glen and marvel at the stunning beauty that surrounds us in every direction. A saunter through light, dappled woodland to a delightful waterfall. For a longer stretch, press on to Edradour Distillery and enjoy the gorgeous downhill amble back into town. The views are breathtaking. 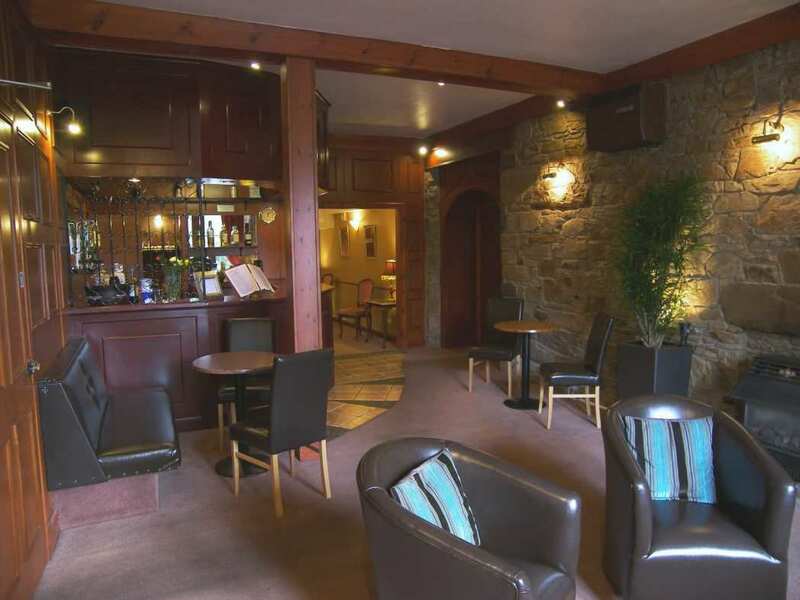 Refreshment at the Moulin Inn or Pitlochry Golf Club enroute. This walk leads from the door of Rosemount Hotel Pitlochry. It can be modified to circuits of varying length which take from around 40 minutes to several hours to enjoy. The great things about this area is that it is away from roads and, until you get towards Edradour, away from sheep. Consequently dogs can be let off-lead. There is also a small pitch and putt area whose periphery can be used to settle the dog with a ball, if necessary. Ben Vrackie, Beallach-na-Searmoin, Ben y Ghlo and Craigower Hill. Ben Vrackie is a well known and much-admired hill which forms the ever-changing and scenic northerly landscape to the bustling resort town of Pitlochry in Highland Perthshire. Because “the Ben” sits to the north of the town, the sun lights its rugged southerly aspect, emphasising the contrast between greens, purples and greys in an ever-moving and dramatic way. All this against an equally dynamic and stunningly contrasting sky. 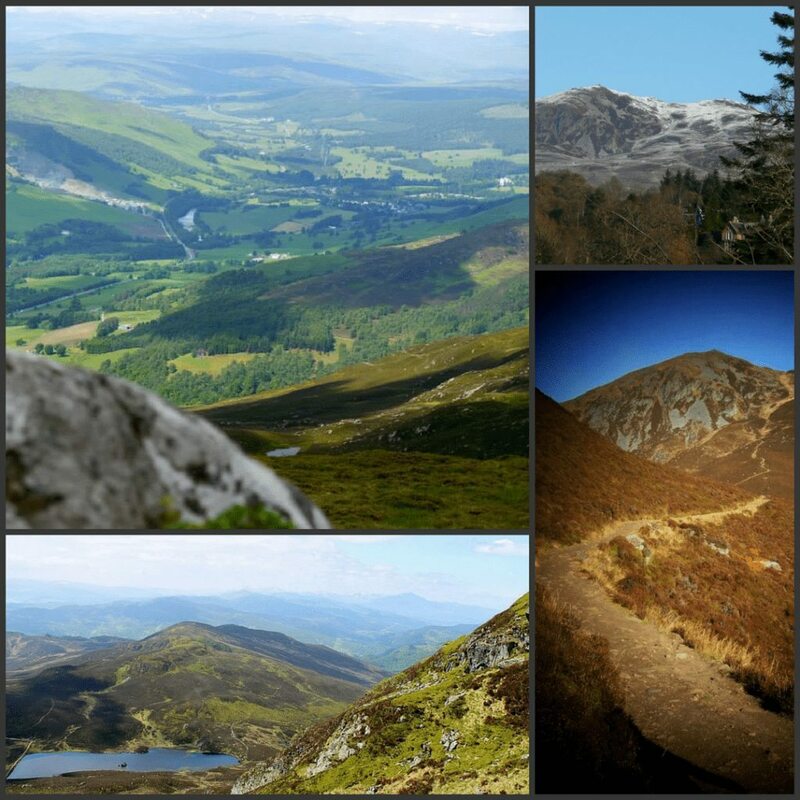 Views of- and from Ben Vrackie, with thanks to Jenny Herdman and Anatoly Zelenin for shares of two of the photos. Ben Vrackie translates as `speckled mountain` and comes from a time when white quartz rocks were scattered across its slopes. On a good clear day the view from the summit of 2,757 ft (841 m) is tremendous with the Beinn a Ghlo range to the north and the sweep of Strathtay and Strathtummel to the west. In exceptional conditions it is even possible to see Arthur’s Seat in Edinburgh. The walk to the summit of this imposing backdrop to Pitlochry town (sometimes known as Ben y Vrackie) is approximately 3 hours there and back from Rosemount Hotel Pitlochry. The path is well-constructed for most of the route, passing beside Moulin Burn and then across heather moorland. A Lochan situated two thirds of the way up provides good safe swimming for dogs – an ideal cooler on a hot day. The final section is more demanding, but worth a little effort in return for the rewarding views. Red grouse and red deer live on the hillside and sometimes a flash of white can indicate the presence of the shy mountain hare. 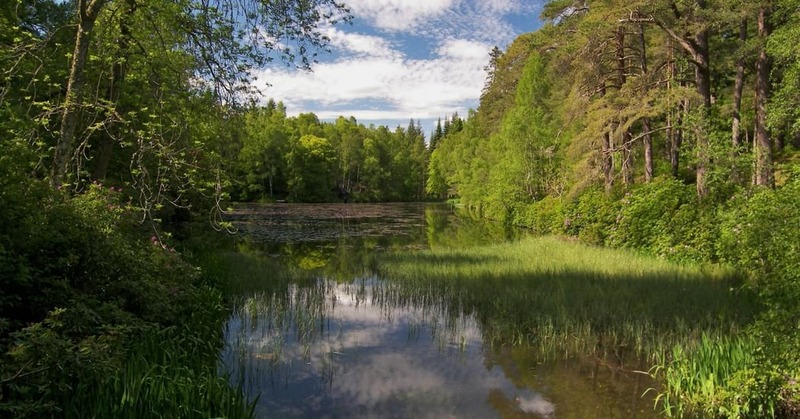 An instantly-loveable, small Loch, just outside Pitlochry, surrounded by mixed woodland and teeming with wildlife, such as Red Squirrel, Kingfishers, Woodpeckers, Owls and some beautiful water birds. A wee holiday treat! An impressive , tree-lined gorge which is simply breathtaking in Autumn, but beautiful all year around. Lots of shelter for the dog, but part of the circuit walk is along a highly scenic road, where, unfortnately , one or two cars may travel too fast. Here a leash is recommended. A must-visit place during holidays in the Pitlochry area. The panoramic view has been described as “spine-tingling”. Near to Queen’s View. A steady uphill walk, passing an abandoned crofting farmstead enroute. One of the buildings has been re-constituted to give a fascinating insight into the realities of living in this area in days gone by. Wonderful views over Loch Tummel towards Schiehallion on the horizon. Visitor centre and country life museum, working watermill and Glen Tilt walks. Blair Castle offers many hours of historical education and interest. Pony trekking and wildlife safaris are bookable within its splendid grounds. Additionally, walkers and cyclists may find a whole network of trails leading from the castle gates. Cycle hire is available just opposite. There is plenty enough to spend a whole day exploring in this delightful hamlet. Just a few miles from Pitlochry. 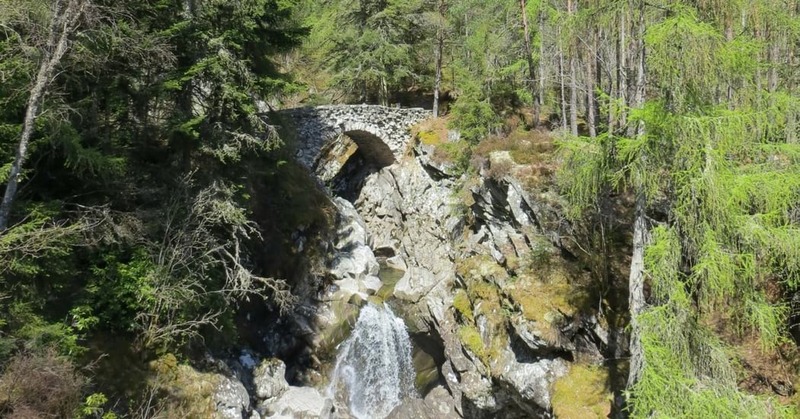 House of Bruar and the Falls of Bruar. 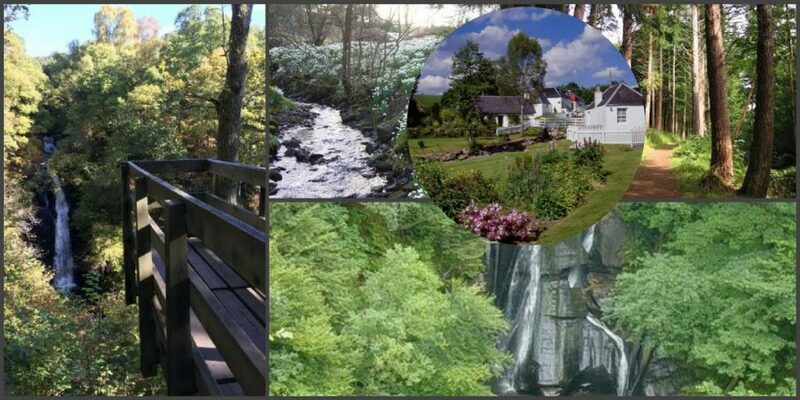 A pleasing combination of top-end visitor facility with a delightful walk passing two waterfalls. 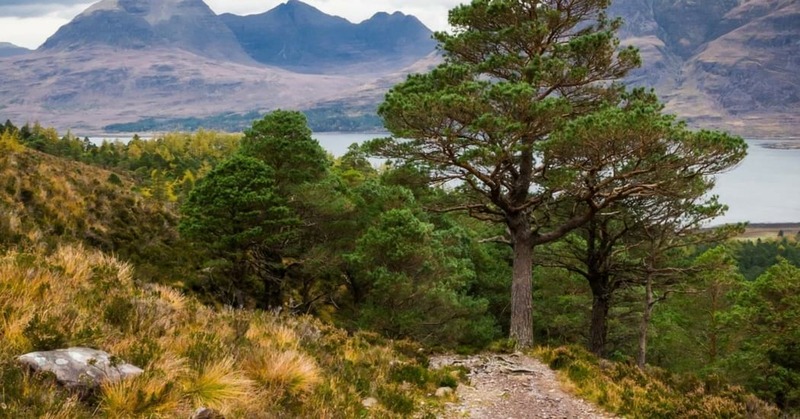 This powerfully beautiful area is often described as the most beautiful Glen in Scotland. 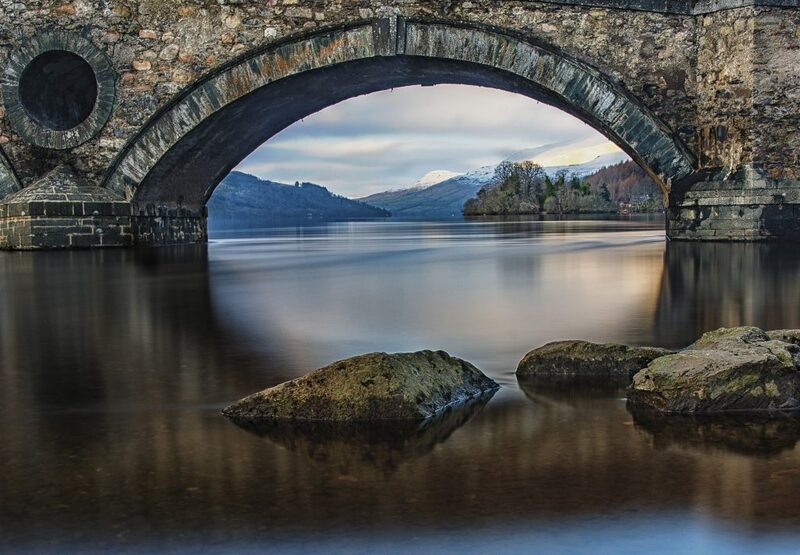 Please take a trip along this beautiful landscape during you Pitlochry holiday. You can drive onwards to Loch Tay and Kenmore, then on to Aberfeldy, the Spirit of Wood, Dewars Distillery and the Highland Chocolatier. A fabulous day out. A quaint Highland town with independent shops, arty cafes and an art-house style cinema. Although the town is only 20 minutes direct drive away, there are several beautiful, scenic routes that we recommend our guests to take with many points of interest, eateries and viewpoints enroute. 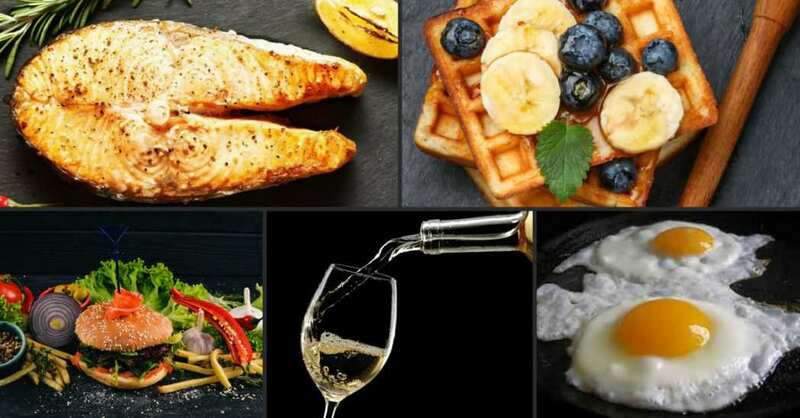 All in all – a full day of feasting the eyes, the soul and the belly! 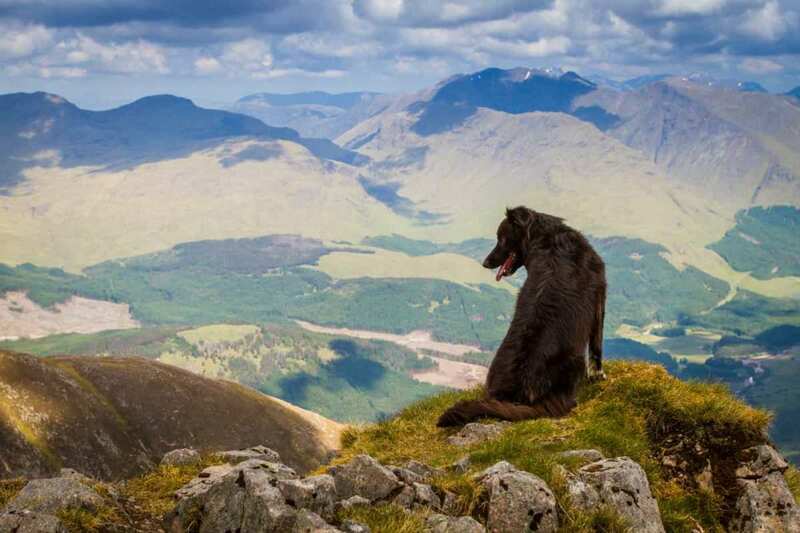 In addition we can direct you to one or two hidden gems, such as Loch Dunmore and uncharted areas of Faskally Woods where you will find safe, clean swimming areas for your dog and a sense of peace and well-being for yourself. For dogs who love to run for their Frisbee or ball, the Recreation Ground provides a stunning setting in which to throw a ball far enough to give you time to admire some breathtaking scenery.